Gladden Spit and the Silk Cayes Marine Reserve, one of the most biodiverse marine ecosystems in the world, is premier destination for swimming or snorkeling with whale sharks. When you get out of the water, hike the Belize rain forest, see manatees in the Monkey River mangrove forests, and visit Cockscomb Wildlife Sanctuary home of the world's greatest concentration of jaguars and other big and small wild cats. A CORNER OF THE SOUTHERN BELIZE REEF COMPLEX. IMAGE: COURTESY OF THE BELIZE TOURISM BOARD. 1. Mating Dances: Over 30 species of reef fish gather near Gladden Spit & Silk Cayes Marine Reserve to spawn each year; it is the largest known aggregation breeding site in the Caribbean. 2. Whale (Shark) of a Time: All of this breeding attracts whale sharks that feed on the spawn, providing a great opportunity to swim with these giants of the ocean. 3. Turning Turtle: The high sandy beaches of the Silk Cayes serve as nesting sites for the critically endangered hawksbill turtle. 4. People Power: Establishment of the Gladden Spit & Silk Cayes Marine Reserve was the direct result of the concern and action by a volunteer group of Placencia residents for the long-term health and well being of their reefs and waters. 5. Rainforest Cats and Ancient Ruins (nearby) too. Take some time on the mainland for rainforest cats ( jaguars, pumas, ocelots, and margays!) and the impressive remnants of the ancient Mayan civilization. The Gladden Spit and Silk Cayes Marine Reserve is a protected area of the Belize Barrier Reef world-famous for its whale sharks. Gladden Spit is a promontory off a sharp bend in the reef structure. This promontory falls sharply into the sea, creating ideal conditions to attract large spawning aggregations of fish, which in turn attract large numbers of whale sharks. The Silk Cayes are three tiny islands that provide an ideal location for snorkeling and shallow reef diving. Although there are a limited number of moorings for overnight sail charters at Silk Cayes, there are no accommodations within the reserve. Most travelers chose to stay in the village of Placencia, and most tour operators serving the marine reserve are based there. Gladden Spit is approximately 22 miles (36 km) east of Placencia, and can be reached only by boat. Gladden Spit and Silk Cayes Marine Reserve are located within the Southern Belize Reef Complex (SBRC), a part of the larger Mesoamerican Barrier Reef System (MBRS). Stretching almost 700 miles (1,125 km), from Isla Contoy, Mexico to the northeast corner of Nicaragua, the MBRS is the longest barrier reef in the Western Hemisphere. The Southern Belize Barrier Reef Complex with its seven protected land and marine areas, including Gladden Spit and Silk Cayes Marine Reserve, is a protected UNESCO Heritage site. But it was not always this way. A group of concerned Belize citizens were instrumental in raising awareness about its importance. In 1993 a group of residents from the village of Placencia became concerned about the long-term human impacts to Laughing Bird Caye, 12 miles (19 km) off their coast. The volunteers formed the Friends of Laughing Bird Caye, soon organizing into "The Friends of Nature" (FoN). Their effort was successful. On 1996 Laughing Bird Caye was declared a national park. The FoN then turned their sights to Gladden Spit and the three tiny uninhabited islands on its western side that form the Silk Cayes. Again the FoN's hard work paid off. In 2000 the Belize government designated the area Gladden Spit and Silk Cayes Marine Reserve. Soon there after The Friends of Nature merged with another conservation group, The Toledo Organization for Sustainable Tourism and Empowerment, forming the Southern Environmental Association (SEA). Today SEA co-manages with the Belize government the Galdden Spit & Silk Cayes Marine Reserve as well as two other protected marine areas in southern Belize: Sapodilla Cayes Marine Reserve and the Laughing Bird Caye National Park. Gladden Spit is considered a critical coral reef fish spawning site. The waters of this reserve are the largest known fish aggregation breeding site in the Mesoamerican Reef - a veritable whale shark café. The reef is also critical for turtles and other species. As of 2015, the IUCN Red Lists four of the species found in Gladden Spit as Critically Endangered, 13 as Endangered, and at least 12 as Vulnerable, including the magnificent whale shark. The technical definition of a spawning aggregation is a grouping of a single species of fish that has gathered together in greater densities than normal with the specific purpose of reproducing. For the wildlife traveler, a spawning aggregation is the chance to see hundreds of fish swirling, dancing, and spawning in the moonlight. At at Gladden Spit, up to 30 species of fish are all aggregating at the same time, from March until June. This behavior also attracts whale sharks that dine on the spawn of thousands of breeding fish. Understanding this behavior is critical for understanding the conservation issues impacting many reef ecosystems. Many species face extinction without the preservation of these critical spawning areas. Climate change is a global phenomenon, and is affecting biodiversity throughout the Belize Barrier Reef System. The affects of climate change are currently being felt at the Gladden Spit and Silk Cayes Marine Reserve through increased coral bleaching and storms; it is expected that the severity and frequency of these events will continue to increase over the coming years. 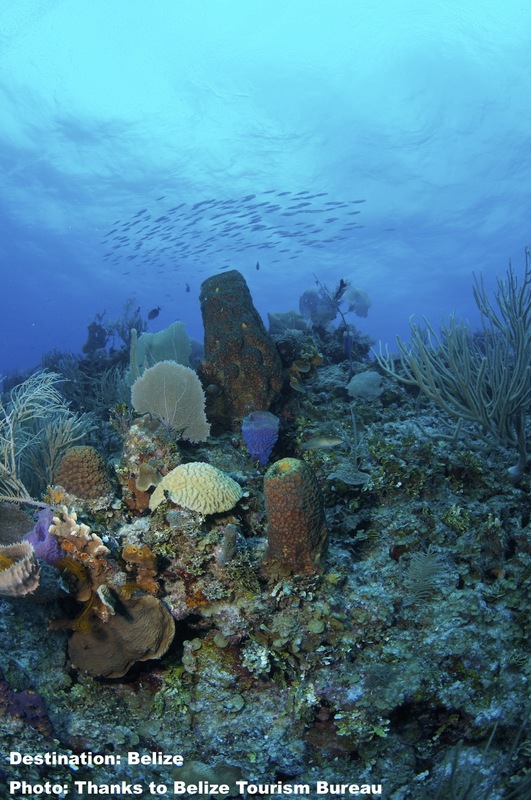 In 2009 Belize's barrier reef complex was added to UNESCO's World Heritage Sites In Danger list. Today the government has implemented a comprehensive plan, described as "visionary" by UNESCO, to preserve the reef. Sharks: whale, Caribbean reef, blue, great and scalloped hammerhead, bull and nurse sharks. Bottlenose dolphins. 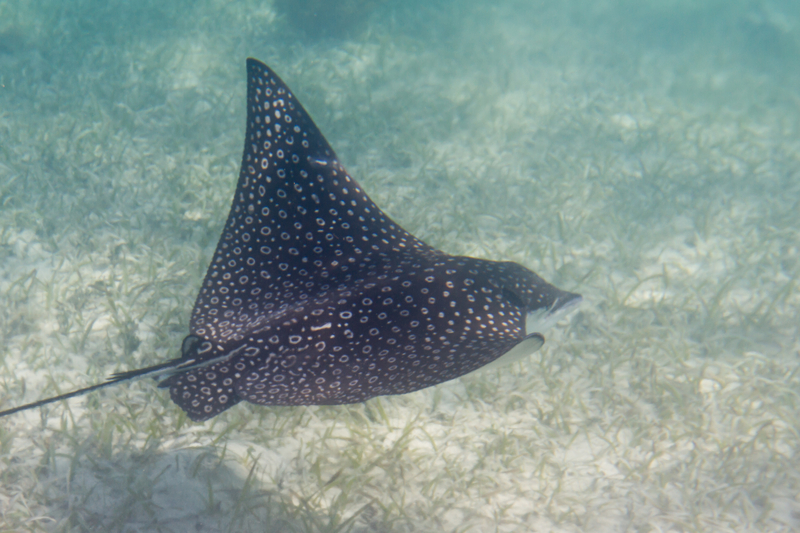 Six ray species: spotted eagle, manta rays, yellow, southern and roughtail sting rays. Four sea turtle species: Green, hawksbill, Ridley's, and loggerhead. Large fish such as cubera snappers, dog snappers, mutton snappers, barracudas, and zillions colorful coral and reef fish such as the parrotfish. Critically endangered coral species can also be seen here: staghorn and elkhorn coral. As well as other endangered corals: Lamark's sheet, elliptical star, star coral, fire coral, montastraea corals, and rough cactus coral. Whale sharks, the largest fish in the ocean, are attracted to the annual aggregation of spawning fish from March through June. Although the sharks are usually present for the entire season, the best periods are from two days before the full moon until 10 days after. There are numerous opportunities to swim with the whale sharks. Be sure to choose a responsible experience provider and review their specific guidelines. Belize is one of the few locations where (SCUBA) diving with the sharks is allowed, but there is no real advantage to diving over snorkeling. When encountered responsibly, whale sharks are usually quite content to remain near the surface and check you out! The Silk Cayes, also known as the Queen Cayes, are three small deserted atolls 20 nautical miles (32 km) from the village of Placencia. The sandy beaches and clear shallow waters makes this a great snorkeling site in general and especially suitable for family adventures. A day trip from Placencia will provide a life-long memory of vibrant colored corals and reef fish. With an opportunity to encounter parrotfish, nurse sharks, barracuda, a variety of rays, and even sea turtles, Silk Cayes is a "Don't Miss" destination. Most services are experienced with first time snorkelers and children, so do not let a lack of experience dissuade your from exploring this underwater world. As always, attempt to choose a responsible local tour operator that cares for the environment and your experience. A half-hour boat ride from Placencia through thick mangrove forests, the Monkey River watercourse provides the opportunity to see huge iguanas, howler monkey, and Morelet's crocodiles. The Belize coast is home to the largest population of Antillean manatee in the Caribbean, and they are often spotted in the mangrove forests at the mouth of Monkey River. Less than an hour's drive from Placencia, the Cockscomb Basin Wildlife Sanctuary boasts the world's largest concentration of jaguars, pumas, ocelots, and margays, as well as a myriad of other animals. Recognized internationally as the world’s first jaguar preserve, it is also known for its spectacular waterfalls, mountain views, nature trails, and rich diversity of neotropical birds. You will not likely see jaguars, but one may be watching you! Although a day trip is worthwhile, plan for two days if time allows. The park offers cabins and campgrounds for overnight visitors. BELIZE'S "GREAT BLUE HOLE" WAS MADE FAMOUS BY JACQUES COUSTEAU IN 1971. IMAGE: THANKS TO THE BELIZE TOURISM Board. Not exactly close to Placencia, but no trip to Belize would be complete without a visit to the Great Blue Hole. Located near the center of Lighthouse Reef at the northern end of the reef complex, this 400-foot (122 m) deep, 984-foot wide (300 m) sinkhole was formed as a limestone cave in the last ice age. When the oceans rose it filled with water and collapsed creating the largest natural formation of its kind in the world. Jacques Cousteau's famous visit in 1971 put it firmly on many divers' bucket list. Belize was the center of the Mayan world, and it has more ancient Maya temples per square mile than anywhere else in the world. 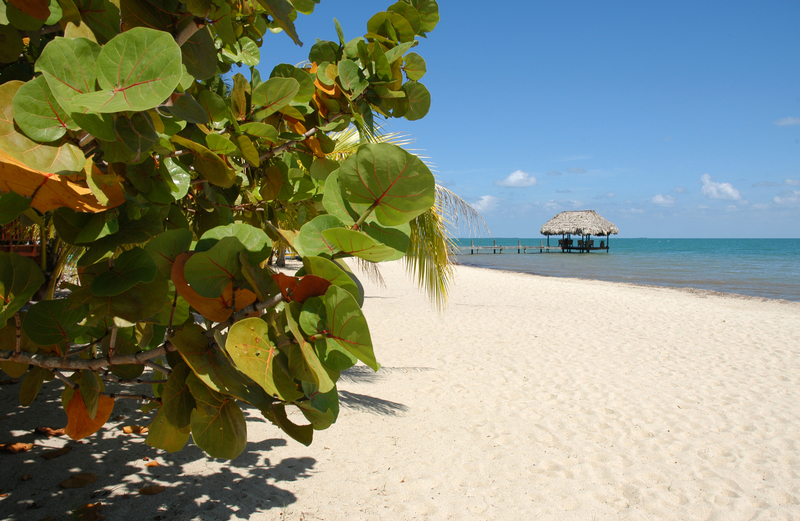 Day trips from Placencia are easily arranged. There are many options when choosing the whale shark experience right for you: viewing from special boats, snorkeling and swimming, or diving. The best idea is to book activities in advance when possible. Most guides can provide snorkeling equipment. Regardless of which you chose, the Belize government is very serious about protecting the reef and their big fish. It is a good idea to familiarize yourself with the rules, for example they limit the area for each boat's use, the amount of time each boat can be near a shark, and number of divers and snorkelers in the water at any one time. There is no flash photography, touching, riding, etc. allowed. Distance regulations include: 50 ft. (15 m) away from the sharks for the boats, 15 feet (4.5 m) away for divers and snorkelers. Please do not touch the whale sharks; touching can remove the "slime" that protects the shark from parasites and infections. Snorkeling and reef diving in the Gladden Spit and the Silk Cayes Marine Reserve is generally good year round. From December through March "Northers" can arrive, bringing several days of thunderstorms. The storms preclude diving. Hurricanes are possible between August and October; approximately 5 percent of Atlantic hurricanes reach Belize. 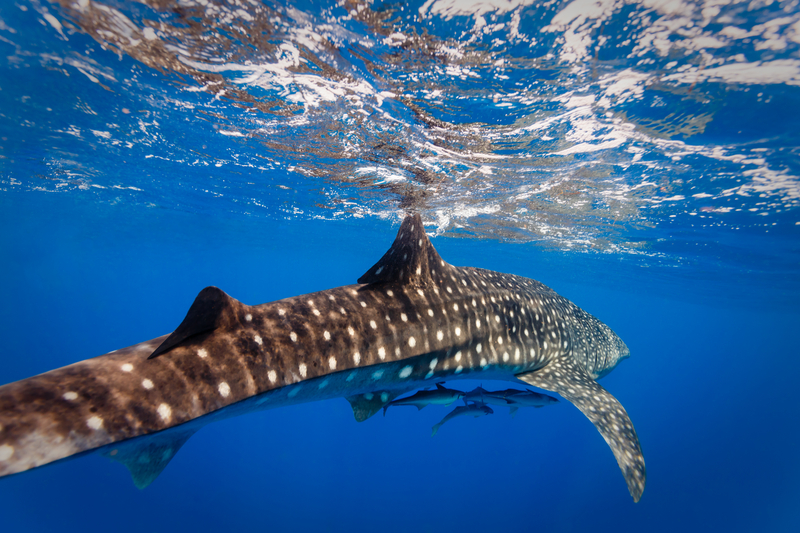 May through June is the best time to meet Gladden Spit and Silk Cayes Marine Reserve's most famous visitor, the whale shark, and the big colorful fish whose spawn they feed on. 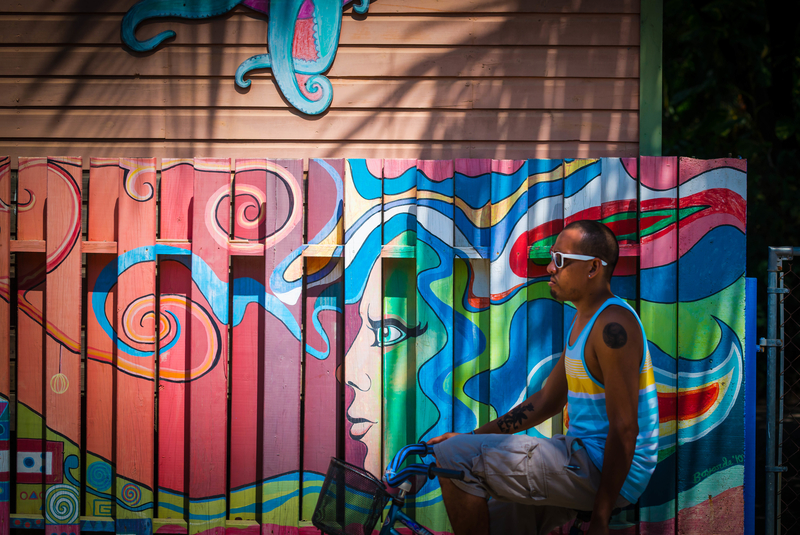 Placencia, called "The Caye You Can Drive To", was once a sleepy fishing village. Now it is a hub for Belize's marine, rainforest, and Mayan ruin tourism. It is the closest town to the Gladden Spit and Silk Cayes Reserve, with a large selection of lodges (from resorts to small inns) and professional and responsible wildlife experience providers. You can fly to Placencia from Belize City. Swimming with the whale sharks has become popular enough to create accommodation shortages during peak periods. It is best to book early if traveling from March through June. A limited number of tour operators provide sea kayak tours throughout the Belize Barrier Reef, including the Silk Cayes. Because the cayes are within a protected reserve, a local licensed guide must accompany all visitors. Supporting local guides is a responsible tourism best practice, and local tour operators can provide quality guides to enhance your experience. English is spoken in most places, some Spanish especially in the north, but in almost every home Belize Creole or Belizean Kriol is the language of choice. The following are guidelines only. Please always be sure to check with the Belize consulate in your country for the most up-to-the-minute requirements prior to planning your visit. At this time, Belize does not require U.S. citizens to obtain a visa prior to visiting the country. As a British Commonwealth country, citizens of other Commonwealth nations and the European Union do not need visas at this time. COLORFUL BLUE CROWNED MOTMOT IS ONE OF OVER 500 BIRD SPECIES IN BELIZE. Yellow Fever: Belize requires proof of vaccination if arriving from a country with a risk of yellow fever. Check with your local consulate for up-to-date information. Malaria: Belize has little malaria, but if adding a rainforest visit to your itinerary, ask your doctor for the best precautions for you - and bring insect repellent. Zika: Outbreaks of zika have occurred in Belize. Discuss your travel plans with our physician prior to making any reservations, especially if you or your partner are pregnant or considering becoming pregnant. Note: Did you find an uninvited roomie in your lodging? That gecko in your hotel room is looking to dine on the insects that bug you. for their help and images used in this article. Gladden Spit and Silk Cayes Marine Reserve adventures and so would other travelers. Share your stories and photos.